Fun and whimsical accessories for women. You've gotta' see these! 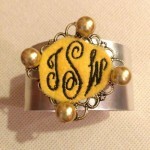 We can create a custom monogrammed or school bracelet, scarf, or poncho!